Now it is well known I have been highly skeptical of automated room correction and Eq systems. I did have a demonstration of Audyssey from Kris Kyriakakis of USC. He was using SVS MTS-01 speakers to demonstrate Audyssey at SOTU. In all honesty I was underwhelmed by the demonstration. I thought the bass was improved, but that overall the sound was worse. Kris canceled all except low frequency correction and then things were improved. So after doing a careful manual set up and calibration of my updated rig, and living with it for a few days, I unleashed Audyssey on my very unusual system not expecting it would make any sense of this highly unconventional system. The most unconventional are the front three, especially the main front left and right speakers. So it is necessary to give a description of operation. As many know I’m a full ranger at heart, and regard all crossovers as a necessary evil. So the concept is to keep the system as close to a full range driver as possible. In fact there is only one complete electronic crossover in each three fronts. These are between bass/mids and tweeters. The mains contain independent aperiodic transmission lines. The center is a single line. The 7″ drivers in the mid line are allowed to roll off in the bass acoustically. F3 is 42 Hz, 44Hz for the center. The bass line has an F3 in the room of 23 Hz. An active crossover sends the bass and step response correction to the upper of the two 10″ drivers. The LFE signal is low pass 60 Hz and fourth order roll off. This signal is sent to the amps powering the lower of the 10″ drivers. The LFE signal is also sent to mono sum buffer amp and then sent to the amps powering the upper 10″ drivers along with the diffraction compensation signal. This is to keep the diffraction compensation stereo. Diffraction compensation is performed by the 10″ driver and not through the 7″ drivers, to off load them and prevent large cone excursions. There is a low pass crossover that provides diffraction compensation to an amp supplying the upper of the two drivers in the center speaker. One of the biggest reasons for an active crossover is to have precise control of diffraction compensation which varies greatly with speaker boundaries and room placement. This is in no way possible with passive crossovers and is a big advance in accurate reproduction. The design concept minimizes phase shifts and time aberrations due to crossover artifact. The surrounds are sealed speakers with Dynaudio drivers with a Fs of around 50 Hz second order roll off. The rear surrounds are biamped dual transmission lines. The system is optimally configured with all speakers set to large, and the speaker bass management set to both with the LFE crossover at 60 Hz. A careful level calibration was done prior to utilizing Audyssey. So I set up the rather cheap feeling calibration mic in the first position on a tripod. I plugged the miserable small gauge mic cable into the jack on the front of the AV 8003. With not much optimism I started the calibration, of the staccato tones played via each speaker in turn and at the end all three fronts. There were two false attempts from problems such as a noisy fly that got in the room. However third time lucky. I measured in six positions. So then I checked results expecting to see nonsense. Well I was dumbfounded that it had done the speaker set up as designed. It did not change any speaker levels from my calibration, and imagine my surprise when I saw it had figured out all speakers should be set to large and the LFE crossover at 60 Hz! All just as intended. The only confusion concerned the woofer distance. It placed the woofer 5 ft behind the mains, and yet they are the same driver. I thought about this and realized the program has averaged the driver and port arrival times. This I had to reverse and manually put woofer and main speakers in the same place as there would have been phasing trouble with the upper diver as it is receiving a mix of signals. It also altered the distances of the other speakers from measured. However I think this has had a highly beneficial effect on getting a more even result though out the room. Here are the results of the Audyssey frequency response correction. In the main except for the surrounds between 1 and 2 kHz the mid band correction was insignificant. However for all speakers except the rear surrounds there was a first order lift put in place above 8 kHz. I think this was because in three of the testing positions the microphone was close to the rear surrounds. There is a fall off of HF with distance and this in my view should not be corrected. Listening test confirmed this. The system sounded better with the frequency response correction canceled. However I was intrigued by this, so I did and experiment purposely introducing a frequency response error. I boosted the level of the bass amps to the rear backs below 150 Hz by 7db. I did a run of Audysey and it caught the problem and corrected it. So in summary I think this program is useful and may well take the edge off loudspeaker errors. I suspect this is much more a loudspeaker correction program than room correction in a lot of cases. For instance I know my surrounds have a slight null between 1 and 2 kHz that was identified by Audyssey. I feel the most useful aspect in my studio was the re timing of the speakers. I think this made a difference in two areas. The sound is more uniform over the seating area. However I think the greatest benefit was the improved sense of space achieved in 7.1 reproduction, especially. I was definitely hearing different spaces captured. In essence the reproduction was to a very large extent freed from the boundaries and constraints of the room. I will make more comments about this when I report on some of the discrete multichannel discs I have listened to. My biggest issue with the system is what I feel to be inappropriate last top octave equalization. I would encourage adopters to be alert to this. My preference would be for Audyssey to only make cuts in the top octave and leave alone any high frequency loss above a first order roll off. I have to say I was fascinated evaluating this system and regard it as a work in progress. I think we are early in total system/room Eq and suspect there is still a lot to learn. Now there are increasing numbers of operas on Blue Ray. It was time to upgrade the studio to take advantage of the audio and video improvements possible with Blue Ray. Since the Oppo BD-83 seems to be good enough for Lexicon, I thought it should be good enough for me. I was not disappointed. The unit arrived superbly packed and presented. The unit was in it own carrying case. Cables were is a nice cardboard box. A very high quality HDMI cable was included. The instruction book is published on high grade paper. English is excellent and idiomatic. The instructions clear and informative. In the play list, the illustration is a compilation of Bach preludes, which I thought added a touch of class. Since I was not planning to use the analog circuits, I selected the standard version, not the SE. Connections were straight forward. One two pin power plug, one Ethernet cable, and one HDMI cable. Audio and video set up using their wizard could not have been simpler or more straight forward. No problem was encountered watching high def audio and video program right away. DVD performance was good also. I have a had a couple of CDs the unit does not like and the other players will. I don’t know what it is about CDs, but they seem more fussy than other digital disc mediums. I know if you have a large collection you need more than one player and probably three! I have a choice of four drives in the system! The unit seems to make no appreciable heat. There is a fan on the back, but I don’t think it has started. This unit is phenomenal value for money and highly recommended. The unit was purchased from the Audioholics store. The staff was professional and courteous throughout the transaction. It was time to change my Rotel 1098 for something more up to date. The Rotel unit, now four years old, had no HDMI facilities, and of course did not contain the new loss less codecs. Also even after to going to a lot of trouble, it was impossible to make the unit totally impervious to RF interference from SCR light dimmers. So on deciding to add Blue Ray, as there are increasing number of opera BD disc it was time for a change. I decided on the Marantz AV8003, because it had the corps functions I wanted, especially a Neural 6 decoder, as MPR are now broadcasting the live Friday night Minnesota Orchestra broadcasts in 5-2-5 neural six. Also the signal to noise ratio was excellent at 105 db. I did do some measurements on the unit. In pure direct mode, at 1 Volt output I measured the signal to noise at 106.2 db A unweighted. I should stress this is at the limit or beyond of my older test gear. However I think it shows that his unit is superior in the regard. The unit has a clipping indicator for the analog inputs. I had to use the 6 Volt out terminals of my Quad 44 preamp and crank it to get the indicator to light! So I measured the head room. This is a really important aspect of audio gear, and not enough attention paid to it. The specs for the line inputs are 400 mv for I volt out at the unbalanced outputs and 2 volts out at the balanced outputs. It took 15 volts in the clip the line in preamp and 14 volts out from the unbalanced connector before distortion was evidentb on the scope. This is a very superior performance. The order of the low pass LFE crossover is not stated. The low pass crossover is fourth order. I did not measure the high pass crossovers since I don’t use them. My system requires the low pass crossover to be set to 60 Hz. At 60 Hz the LFE output is 6 db down compared to a reference signal at 30 Hz. At 120 Hz it is 30 db down. I have not idea why manufacturers choose to hide such vital information from the prospective user. That is irritating to say the least. The unit is impervious to SCR noise, and is exceptionally quiet in use. The unit is well constructed. I did not remove the case, so as not to void the three year warranty. However a large toroidal power transformer is visible. The boards are stacked in logical fashion close to the inputs and outputs. There appears to be no crowding, and I would think service would not be a nightmare. I purchased the optional rack mounting brackets, which gave me one of those “what do I do now moments,” at the start of installation. The standard practice for 19″ rack mounted equipment is to mount from the front. The front mounting is 19″, but the space through which the equipment goes is 17.5″. Now the main body of the case will fit the 17.5″ width. However the case bells out at the front because of the fascia, and the brackets bell out as well, so it will not go all the way in. So the unit has to be mounted from the back instead of the front. Now the mounting brackets were slightly too wide to go into my rack from the back. I think it would have gone if the rack had been fabricated of steel. However because if humidity/rust issues I fabricated the racks from aluminum, which requires a greater thickness of metal. So I had to take off exactly 3/32″ from each bracket with a JET band saw in my shop. Fortunately the inside width of the mounting brackets when mounted is 17.5″, and the inside rack spacing of my racks is precisely 17.5″. So I was able to make a cosmetically acceptable job of the installation. As you can see, because of the need for rear mounting the inside metal edge of the rack is exposed, which it would not be with the usual front mounting. Here is a frontal view of the mounting. I took the opportunity to fully revise the some aspects of the installation as the LFE crossover is different. I revised the active crossovers that send the the low pass output to the upper 10″ driver in the large bass lines, to improve the diffraction compensation to the 7″ drivers in the bass mid line. The SEAS ecal drivers are a challenge to say the least. I modified the crossovers to better compensate for the rising response of those drivers above 200 Hz. The unbalanced LFE output goes to the lower 10″ driver. I added an ATI L200 buffer amp, replacing my buffer amp to send the LFE signal to the upper 10″ driver also. This requires a mono sum buffer amp, as the diffraction signal has to be stereo and the LFE is mono. Without buffering the diffraction compensation would be mono. The ATI L200 was connected to the balanced LFE output of the AV 8003. Other connections were quick and straightforward, as I can get behind my equipment in the studio mechanical chase. Doing Audio, speaker, input and video set up was quick and straight forward. I should add that the instruction manual is poorly written, sufficiently poor that it would give the novice a lot of difficulty. There is a lot of “Pigeon English” in the manual which is unacceptable in a unit of this quality and price. Functionality is good. You can can use digital and analog inputs of the same label. If a digital signal is resented it will use that. If an analog one is presented it will use that. No need to go back to the menu. That is a nice touch. As far as recording, only an analog input selected is presented at the analog tape out. So you can not record from the analog outs and listen and or watch something else. That is inconvenient. The Rotel had this covered. I did a vet careful manual set up, before experimenting with Audyssey. My review of Audyssey is a separate review. The unit is easy to use. There is a left control knob for changing inputs. I use this the most, as you need to be at the equipment to switch units. It is faster than using the remote. The right knob is for volume. The knobs are on plastic shafts and have a little wobble. I think this was done to stop static on the fingers transmitting to the electronics and cause failure and damage. With the Rotel, it would lock up if you touched a knob without discharging yourself first. This unit does not require you discharge yourself. The rack mounting by the way securely bonds the unit to the robust studio star cluster ground plane. The power cord is two pin with no grounding prong. There is a pull down panel to get to the other front panel controls. The most frequently used front panel controls are the button to select the7.1 channel analog inputs, and the selector for direct and pure direct modes. The Direct mode, by passes everything except volume, and the pure direct in addition switches off the video circuits. Audio modes such as Dolby Plx stereo etc are best switched from the remote. They can be changed quickly on the fly. I have not got into file sharing yet, but I might. I have no difficulty sending any audio file from a file my audio workstation via its RME Fireface 800, in SPDIF digital or analog. So far the unit has performed flawlessly. Both sound and video are beyond reproach. In pure direct it is literally a wire with gain. I did not have much expectation that the FM tuner would be of high caliber. However I was wrong. It is a first class FM tuner. It is every bit the equal of my quad FM 4 which I hold in high regard, as do numerous others. The unit also comes with the iBuquity HD radio system. This unit did not endear me to that system any more than the little Sony unit I bought to evaluate that system. An analog FM is significantly better in all aspects except dynamic range. The only issue I have is this. I have found is that it decodes SACD discs incorrectly from PCM via HDMI. The rear channels in SACD should go to the center backs. The Marantz sends them to the surrounds, which is not what should happen at all. So I’m glad I kept my Marantz player in the rack, as I have to still use the external analog inputs for five channel SACD. I have reviewed this recently and find that the speaker and monitoring arrangements for SACD in the US and Europe are different. Since all my SACDS are from Europe, I have to use the 7.1 analog inputs for SACD playback. The unit has a power draw of 60 watts and makes significant heat. This further reinforces my view that complex processors like this should not be in the same case as power amplifiers. So I have to say that I would recommend this unit who has need of a pre/pro for AV. I purchased the unit from my local dealer Hi-Fi sound of Minneapolis. I have had good relationship with them for over a quarter century. They gave me a discount. I purchased the unit with mounting brackets for a little over $2300. I could not be more pleased. The ATI L200 is a useful device. Its main uses will be to buffer blended signals. To place a mono signal in two independent outputs. For use as a positive or negative gain stereo or mono voltage amplifier. The L200 has two xlr balanced inputs and two balanced outputs. It can provide up to 28 db of gain down to zero output. Input impedance is 40 Kohm and output impedance 40 ohms which presented a problem that I had to solve. The unit comes with a 24 volt DC power supply. There is a 24 volt DC output that can power another unit. Be careful if you do, the outside of the DC plug is hot! I used my unit as part of my triamped dual aperiodically damped transmission line monitor speakers. These are a novel design of mine and are truly full range. However the LFE signal which is mono needs blending with the signal from the low pass active filters which are stereo. However the low 40 ohm Zs output impedance drastically dropped the output from the low pass crossovers. So I had to modify the unit to increase the output impedance. One other problem, when power is cut to the unit a large spike appears at input and output. The unit sent my Marantz into reset. So I have left the unit permanently on. The unit contains no on/off switch. All in all the unit is nicely made, has excellent signal to noise in all modes except maximal gain where it is noisy. It would be better if it did not have a huge turn off thump, and had provision for a higher impedance output when used as a combining buffer amp. However when all is said and done this is a useful unit, but for the price could be improved. iBiquity/IBOC HD (Hybrid digital) radio system. An evaluation performed using the Sony XDR-F1 HD FM/AM Digital Tuner. I was invited to review the Sony XDR-F1HD by Jeff Nelson, public affairs director for Minnesota Public radio (MPR). My first experience of the iBiquity/IBOC hybrid digital radio system was around two years ago, when I specked and installed a system for a musician in the Falcon Heights area of the Twin Cities. I used the Sangean HDT-1HD. 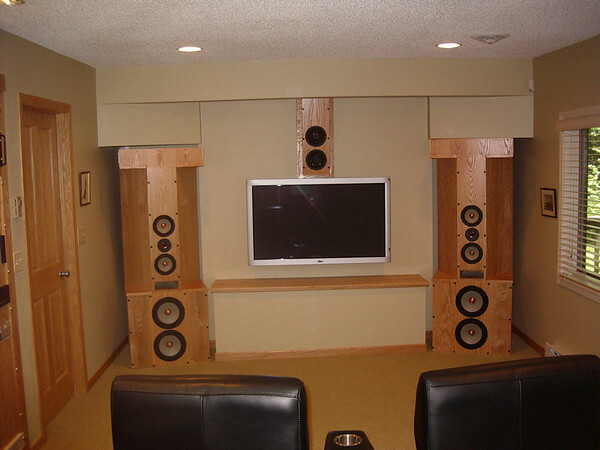 The ancillary equipment used was a NAD integrated amp and a pair of D’Appolito Thor transmission line loudspeakers. These are a superior high-resolution speaker. At the time of the installation, I had with me a good friend, who also has a good ear. We used for evaluation the classical FM MPR station 99.5 out of St. Paul. The provided dipole antenna was used which gave adequate signal at that location. Impressions of the HD quality were not good. This was not an extended evaluation. The Sangean unit allows switching between analog FM HD. My friend and I double blinded each other and were easily above to distinguish the two, and it was not in favor of the HD. It sounded weird, but time did not allow detailed analysis. A choral selection that was played sounded particularly unpleasant. So I was not opposed to a more formal assessment of the iBiquity/IBOC Hybrid digital system. We should get one irritation out of the way right away. I think there was intention by iBiquity to pull the wool over the eyes from the start, to make people think the HD stands for high definition. It does not. It stands for Hybrid Digital. The iBiquity digital system is broadcast on the side band of analog FM and AM broadcast systems. It is licensed by the FTC to be broadcast at 1% of the power of the analog signal. In theory it is supposed to be transparent to the listener of the analog signal. However in cars at the limits of range, the digital signal adds a spit artifact to the analog FM sound as you progress. There is an application before the FTC to boost the digital signal to 10% of the analog signal, which would reduce the analog signal a further 9%. The result would be that the digital signal would have a range slightly beyond the range of the analog FM signal. Currently the digital coverage is about 30% less than the analog FM signal. This change would reduce the range of current FM signal and substantially worsen the moving artifact at the ends of the range. The FM and digital signals are combined with a proprietary combiner. This is known to cause linearity problems at the transmitter amplifier. Traditionally transmitter amps have been class C types. Up grade to more costly AB transmitter amps is recommended when being fed from a combiner. One wonders how many stations have actually done this. The maximum bit rate allowed by the FTC is a streaming rate of 130 kbs. 42 kbs streaming rates are common. 96 kbs is the current max bit rate currently supported in the US, If only one digital channel was broadcast then the system would allow a maximum streaming rate of 300 kbs and support multi channel audio. The lossy codec used is called by iBiquity HDC. This codec is known to be derived from the PAC Lucent codec. iBiquity claim better performance at low bit rates for their modification, more about this later. The system allows for the simulcast of the analog signals broadcast by the transmitter in HD and also additional channels not broadcast in analog. There are also extended side bands known as HD2 HD3 etc. However as channels are added the bandwidth is shared and bandwidth has to be shared by all programs, and must fit within the analog broadcast mask as determined by the FTC to minimize inter-station interference. In a simulcast situation where the HD signal is inadequate, or becomes inadequate, HD units default to analog FM. The system is very complex and this narrative has to be regarded as providing minimal information for a reader to understand the broad concept of the system. Now to the Sony XDR-F1HD, which is a small compact unit measuring 7 1/8 X 2 3/8 X 6 3/8 inches. The unit is quite heavy for its size weighing 2lb 6.8 oz. The front panel has on on/off button and display window. The rear panel has a 75 ohm FM antenna input, two small and awkward spring-loaded connections for the AM antenna, two stereo RCA analog output terminals and a reset button. There is no SPDIF digital output. Also provided was a crude FM dipole flexible wire antenna. The cable was bell wire type, which was neither 75 ohm cable, nor 300 ohm balanced cable. The termination was by a 75 ohm male antenna plug. There is no impedance matching transformer balun. There was a frame type AM antenna with bare wire connection to the spring-loaded connectors. Awkwardly the top panel contains a row of buttons, from left to right, display, band, scan, HD scan, menu, tune-, tune+, enter preset- and preset+. Fortunately all these functions are duplicated on the full function remote. This unit is easy to set up and use. It is mains AC powered. The display can show the clock, the band, the signal strength meter, which has three bars, the station name and frequency and RBDS information if available. Setting the clock, adjusting the display and setting the station presets was straightforward. There is also a sleep timer, which seems strange for a unit not containing amplification or speakers. This mode was not evaluated. This evaluation has become not only a review of this Sony unit but a comparison between iBiquity HD1 versus analog FM, and also of streaming internet audio from MPR and the XM-Sirius satellite radio system. The location was on Benedict Lake, Benedict Minnesota. As the crow flies this is about 35 miles from the MPR Bemidji transmitter at Blackduck MN. This broadcasts the classical service on KCRB 88.5 FM and the news service on KNBJ 91.3 FM. Both stations simulcast an HD1 hybrid digital signal. Now a word about the ancillary equipment used for the evaluation. This evaluation was carried out at Walberswick Studios Benedict. A roof Yagi Uda array was in use, directionally set to the transmitter by instrument. The unit is by Winegard, and in addition to the active dipole contains four directors and four reflectors. The signal is fed down to the garage area where there is a wide band two way splitter using good 75 ohm coax cable, the two coax cables then travel in separate conduits, to a Quad FM 3 tuner in the lower level family room and to a QUAD FM 4 tuner in the fourth level studio. The Sony HD unit was formally installed in the studio. Another wide band two-way splitter was installed in the equipment chase, connecting via good quality coax 75 ohm cable to the Quad FM 4 and the Sony XDR-F1HD. The equipment list is comprehensive. The analog output of the XDR-F1HD was fed to a Quad 44 preamp. This unit designed by the late Peter Walker OBE, has an exemplary performance. The output of the Quad 44 was fed to the studio switch bus. From the switch bus instant connection can be made to an analog input of a Rotel RSP 1098 preamp/processor, or an analog input of an RME Fireface 800 DAC/ADC. The Fireface 800 was connected to a Carter audio workstation via a Firewire 800 connection. The audio workstation was designed and built by the author to meet the exacting standards required for audio processing. The workstation is loaded with Steinberg WaveLab 6 software, and also the drivers and software to control the RME Fireface 800. Dual screens were used. The RME was connected to a SPDIF digital input on the Rotel RSP 1098 with a good quality (Blue Jeans) 75 ohm RCA SPDIF cable. To evaluate Internet digital streaming the 128 kbs stream from MPR was used. The player was Winamp connected to the RME unit, outputting via RCA SPDIF. To compare the analog FM signal the Quad FM 4 was used. This is a Peter Walker design form the eighties, but this high quality unit can still be considered a reference FM tuner. This tuner was connected via analog DIN/RCA cables to an analog input of the Rotel RSP 1088. The analog outputs from the tape outs of the Rotel unit were connected to the studio switch bus via analog RCA cables, for quick switching comparison, signal leveling and analysis in WaveLab. In this way precisely level matched signals could be instantly switched between analog FM, HD radio and streaming Internet audio, playing the same program. Levels were set using the very accurate metering in WaveLab and with an spl. meter. A word about the speaker system is in order at this point. This is a 7.1 channel system. The front left and right speakers are dual aperiodically damped transmission line speakers. The drivers in each speaker are two 7” and two 10” magnesium alloy drivers from the SEAS Excel line. The tweeters are SEAS Excel Millennium tweeters. There is one passive crossover and two active crossovers. The speakers are critically damped providing non-resonant bass with a Qt of 0.5. The speakers are powered by Peter Walker’s current dumping amplifiers, one Quad 909 and two Quad 405 2 power amps. The system is fully step response/diffraction compensated. In addition to a very smooth on and off axis response, the bass is highly defined and articulate. Since high spls. can be obtained in room to 20 Hz no dedicated subwoofer is required. 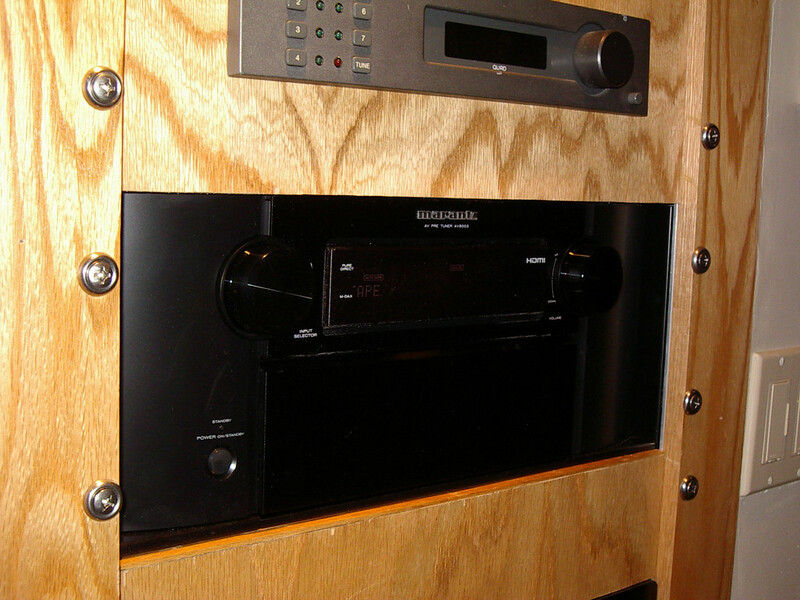 The center speaker is another aperiodically damped transmission line using SEAS coaxial drivers, although only the lower unit has the tweeter in use. One passive and one active crossover are used. The speaker is diffraction compensated and powered by a Quad 909 amplifier. This speaker is highly musical and reproduces the human voice, both sung and spoken in a remarkably realistic fashion. The surround speakers are of a sealed design using two Dynaudio W 75 extended range mid-woofers, and a Dynaudio D28 AF tweeter, in a 2.5 way diffraction compensated design using passive crossovers. The speakers are powered by a Quad 405 2 amplifier. The rear back speakers are dual aperiodically damped transmission lines. The bass drivers in each speaker are two KEF B139 units. There is one Dynaudio M 75, D 52 AF and D21 AF per speaker. There is one active and one passive crossover in each speaker. The speakers are powered by two Quad 405 2 amplifiers. The speaker system was designed and built by the author. This system is considered an accurate reference monitor system built to the most exacting studio specifications, and considered amply adequate for this review. The total power available to the speaker system is 2 KW continuous. The electronics were powered via APC smart UPS units, including the subject of the review. 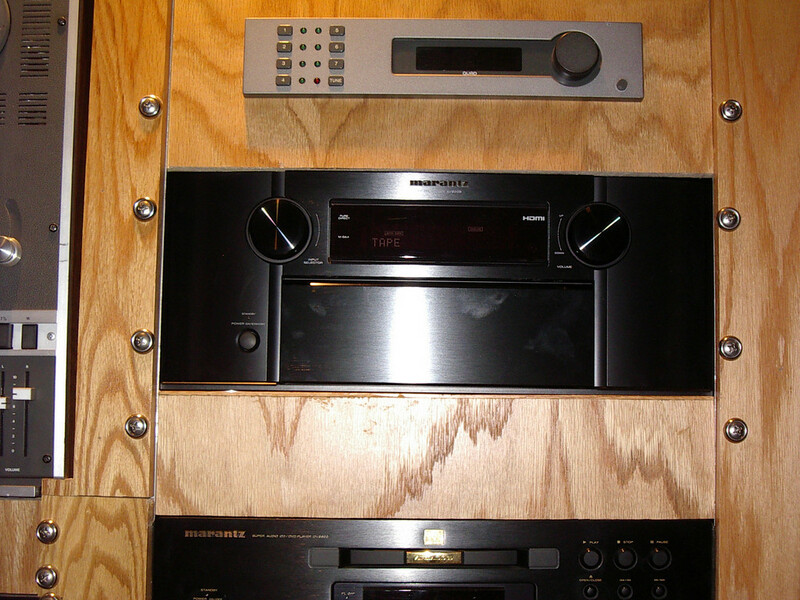 During the evaluation two channel stereo was largely used using the front left and right dual line speakers. Connections were either analog stereo or two channel PCM. For reasons that will be discussed in the review, Dolby PL IIx music mode was also used during part of the evaluation. I should state that the Quad FM 4 receives a signal from the roof Yagi Uda array adequate for high fidelity reproduction, free of audible background hiss at the listening position, and free of any radio born, or other interference. So how did the Sony XDR-F1HD perform? After setting the unit up it was first used with the provided FM antenna. Results were very disappointing. No FM stations of listenable quality could be received. There was not sufficient sensitivity of the tuner to activate the HD signal and it defaulted to FM. To put this in perspective, none of our current vehicles, or any we have owned, have had trouble finding a stable FM signal at this location or immediate environs. So the tuner was plugged in to the feed from the roof Yagi Uda array trained on MPR Bemidji. Right away things were considerably better. It detected both MPR stations without difficulty and the HD symbol stayed illuminated, showing the receiver was detecting and reproducing the HD signal. The level meter has three vertical bars and all were displayed. There were no other HD signals in the area other than from MPR. The unit does not allow switching between analog FM and HD, so the quality could not be directly compared using only this unit. There were over compressed rock stations that did not allow useful evaluation. There was one country and western music station that seemed to have good clear signal, and the Sony unit provided analog FM of good quality from that station. This was enough to convince me that the analog circuits of this unit were not a significant limiting factor. One further comment about the FM sensitivity of this unit. In order to provide analog FM of listenable quality, at least two bars on the signal meter have to be displayed. However all three bars had to be displayed to guarantee good FM reception. On some stations with two bars displayed reception was adequate for others it was not. Also if reception was not adequate, in addition to poor signal to noise there was excess distortion and unpleasant modulation of the program by the noise floor. This unit has to be judged to have poor FM sensitivity. There are not enough FM stations close enough together on the dial to comment on FM discrimination and rejection. However poor sensitivity is usually accompanied by poor performance in these other areas. It would seem to me that though this unit is inexpensive, I paid $84.49 for my unit, including shipping; there will be significant added expense. Unless the location is close to a transmitter, I fear a high gain roof antenna will be mandatory, especially to reliably receive HD signals. The cost of the antenna will run around $100 and installation depending on the circumstance of the home, probably between $300 and $400 dollars, unless the owner can safely carry out the installation of the antenna. The AM section was then assessed. As is typical of modern AM tuners, the performance was dreadful. Only a handful of AM stations could be obtained at this location were speech was even intelligible. I could find no AM stations supporting HD, so the performance of HD AM could not be assessed. One other issue: The unit under test produced a significant amount of heat, so it needs good ventilation. The unit becomes quite warm, but not uncomfortably so. The power consumption is not stated but is obviously significantly higher than an analog FM tuner. This should annoy the “greens.” In contrast my Quad FM 4 produces no discernable heat to the touch. The next part of the evaluation consisted of comparing the HD signal to analog FM from the Quad 44 and 128 kbs mp3 streaming from MPR. For the vast majority of the testing the classical KCRB and classical streaming signal were used. The first step was to carefully level match the three sources by metering within WaveLab and with an spl. meter set to slow ballistics. Great care was taken to precisely level match. During the time of this study I have had no assistance to blind it, however the sources are easily distinguishable, especially HD from analog FM. There is time delay from the Internet stream, which hindered precise comparison somewhat. So how did HD stack up to analog FM? I’m sorry to have to report not well. The first thing that distinguished the HD signal was a peculiar excessive ambiance that seemed to somehow unnaturally widen the sound stage. At the same time it did not support a stable central image. All the time one was aware of two distinct speaker sources not working well together. Vocals, solo instruments sound wide, with no defined location in space. This was a most disconcerting effect. Choral selections in ambient spaces sounded particularly weird. The other issue was not only a lack of bass compared to analog, but a significant reduction in the quality of the bass. The bass stings lacked the natural bloom this speaker system so beautifully reproduces. On this system, the notes of the individual tympani can be easily distinguished. I could not do this from the HD signal. The strings lacked their lovely smooth sheen and sounded significantly steely. Piano lacked the correct timber in the bass strings and the higher strings showed some brittleness. The brass, especially the trombones lacked their deep-throated luster. Voices sung and spoken were also changed in timber and poorly focused. Prolonged listening resulted in a lot of listener fatigue. The analog FM signal was free of these defects. These latter aspects I have noticed with all low bit rate lossy codecs. Now I would have thought that the HD would have had a clear advantage in signal to noise and therefore dynamic range. As far as I could tell the dynamic range of the analog and HD signals was identical. Both systems provided hiss free listening at the seated position. When putting an ear to the tweeter the HD had a slight but not significant advantage. However it was the peculiar unnatural ambiance with poor focus and the inability of the system to provide a locked central image that really caught my attention. I compared the 360-degree phase scope patterns of the HD and analog signals in WaveLab. The patterns were markedly different. I performed an intensive Internet search to see what I could discover about this observation. One of iBiquity’s claims is that their HDC codec performs better than other low bit rate codecs and loftily claim good performance with bit rates as low as 42 kbs. I found reports that there are linear phase problems with the PAC Lucent codec. However I eventually ran into information stating that the stereo image for the iBiquity HDC codec is M-S derived. Now this is a technique used mostly for a type of microphone set up. In fact this is a technique, I frequently used myself when making recordings for the public radio station KFJM in Grand Forks ND. Now in this system an omni directional or forward facing directional microphone is connected to the mix desk and panned center (mono). Then microphones are placed facing direct left or right, or a figure of 8 microphone used where the left and right facing elements are 180 degrees out of phase. The left and right signals are then mixed with the center signal to produce the left and right channels. Now balancing the center and side signals is crucial. Too much center and you have a collapse of the stereo image that is close to mono. Too much side and you have an ill focused ambient sound stage. I would only ever use this technique when I could balance with good monitor speakers to get a believable and natural sound stage. I would never do this balance with headphones. So it seemed to me this system had too much left right and not enough center information. The question was why? Well I soon came across a paper showing that adding ambiance was the easiest way of hiding the undesirable effects of low bit rate codecs! So how to put my hypothesis to the test. I reasoned that the Dolby PLIIx music algorithm would unscramble the egg so to speak. So I switched from two channel to Dolby PLIIx music. Sure enough as I advanced the power slightly to the center speaker, I had a stable stereo central image and the artificial abnormal ambiance disappeared. The problem was the sound was dull and flat and sounded like any other low bit rate codec I have ever evaluated! So there you have the dishonest slight of hand uncovered. The unfortunate thing is that this excess ambiance is something the inexperienced listener might glum onto and actually prefer at first hearing. However it is not realistic or pleasing, and I’m certain would be a fundamental detriment to serious listening, especially choral music in ambient spaces. So how did the mp3 128 kbs streaming stack up to analog FM? Actually it stacked up surprisingly well! The biggest difference was in the depth of bass and its quality. Violins were less silky and piano a little brittle. The sung voice also was harder edged. Of course choral music in ambient spaces, especially British boy sopranos, against powerful organs in their fine cathedrals produced a sound significantly below satisfactory. No lossy codec I have evaluated has been up to the task of this type of program material. For the most part this source provided comfortable listening for extended periods. On much program it was very hard to distinguish it from analog FM. It was far superior to the iBiquity/IBOC in performance. In the course of my intensive evaluations spanning four days, I included the XM-Sirius satellite system. In this location, my only option to receive a high definition television signal is via satellite. I’m a subscriber to the Direct TV system. The package includes access to the XM-Sirius satellite radio system. So I tuned into the classical channel “Symphony Hall”. All I can say about this was that it was an excruciatingly awful experience. The sound had no dynamic range worth talking about. The upper bass was severely bloated, the highs were rolled off, I suspect to disguise frank digital twinking artifact, which I could detect through the fog. Like the iBiquity HD, the sound was way over ambient. The Sirius system uses the PAC Lucent codec. I cannot be certain of the streaming rate, but I have good reason to believe it is 64 kbs and sounds like it. I have a hard time believing that all that investment in technology can go towards producing something so dreadful! So the question becomes, what is the place of the Sony XDR-F1HD? It is cheap enough and seems well made for the price. However if there is an HD signal it defaults to that. The HD quality is significantly inferior to analog FM, yet the unit cannot be switched to analog FM when receiving an HD signal. The unit’s only use would be to receive a non-simulcast program. At this location there is no such program available, and so the unit for me has no utility, other than to evaluate the iBiquity/IBOC hybrid digital transmission system. I should make clear that the major flaw of this unit cannot be laid at Sony’s door but iBiquity’s. In fact I would single out iBiquity for severe criticism. They have deliberately misled the public by giving it the acronym “HD”. They have made claims that its performance is close or even CD quality. MPR continue to make the claim that it is CD quality. It is not even in striking distance of CD quality. What it is, is a low fidelity transmission system and in no way even a serious replacement for analog FM. It is another bad example of the modern decent to the bottom. The whole scheme is to cut and reduce corners as much as possible, and fill the airwaves with more signals of poor quality. And then deliberately mislead the public into thinking that this is a great technological advance that will bring them CD quality over the air. A total disgrace typical of what we have seen in these recent money grubbing years. As far as I can tell the only HD tuners are this one and those from Sangean. The quality of the iBiquity/IBOC system is not likely to encourage higher end manufacturers to produce units of the build quality of my Quad FM 4. To summarize the state of play of the systems evaluated, analog FM provides the best and most believable listening experience of the formats tested. However the mp3 128 kbs Internet streaming ran it a surprisingly close second. If the bit rate could be increased to 300 kbs, then this system could likely equal or probably exceed analog FM on most program material. This would encourage the production and marketing of more Internet streaming radios. The iBiquity/IBOC system falls well short of the mark in terms of required audio quality, at least for classical program. The quality provided by the XM-Sirius satellite system, does not even merit consideration as a serious broadcast/listening system and the less said about it the better. There is need for a much better digital replacement for analog FM. It is now over 60 years since Major Armstrong’s first FM broadcast in New York City in 1948. The fact that modern technology has not yet bested his broadcast system is a tribute to his achievement, which is still standing the test of time, against very inferior competition; how sad. Adcom GFA-555 II power amp circuit and service manual. The cost of the SEAS EXEL drivers is too great for some to bear in these economic times. I have explored the possibility of using the above drivers as a less costly alternative. The Thiel/Small parameter are an acceptable match. Fs is 4 Hz higher, VAS is virtually identical, and Qts is slightly lower. I consider the mismatch however to be acceptable. The line as built is slightly long. However, I think the line will function well. The SEAS CA18RNX bass/mids are $75 from Madisound, so that would be $300 for the pair. The SEAS 27DTC Tweeters are 39.91 from Madisound, around $80 for the pair, bringing the driver coast to an acceptable $380. Here is the pdf for the woofers. Here is the pdf for the tweeters. I have designed a crossover for these drivers. This crossover is elegant and simple. Although the pdf states that these are second order Linkwitz/Riley filters, they are actually highly customized. The low pass filter is actually first order from 1KHz to 5 KHz. At5 Hz, the composite electrical and acoustic roll off becomes fourth order. The woofers are down 18db an octave above the crossover frequency of 2.8 KHz. Req and Ce provide impedance compensation to the woofers. The high pass filter is also first order 8 KHz to 1.8 KHz and transition to fourth order after that. The program does not let me show R1, which changes the Q of the filter. Note that C2 shows a resistance of 2.005 Ohms. Now no cap will have that resistance. So a 10 watt 2 ohm resistor needs to be placed in series with C2. This is an easy to build seven element crossover. You can see that the filter is first order in the crossover region, as the phase angle is 90 degrees, or a quarter cycle in the crossover region. Also this crossover puts the tweeter 48 db down at its resonance of 550 Hz. So there should be no tweeter harshness. A standard first order filter would have put the tweeter down only 14db, at resonance. Since this is an odd order filter at crossover, it will fulfill the lobing requirements of the d’Apollito configuration. There is also around 3db of diffraction compensation with this crossover. Since the phase and time response of this filter is well above average, transient response should be superior. Good parts should be used for the crossovers. Air cored inductors and polypropylene caps, such as Solen caps should be used. I think where funds are a problem, these drivers and crossover should be given serious consideration. I will work on a TL for these specific woofers. I think this design carries the promise of unbeatable value for money. The line will end up being a little smaller than the Thor line. Power handling will be less, but a respectable 160 watts. I attended the SOTU event in Orlando last month. It was an opportunity to listen to some of the equipment talked about on the Audioholics forums and see equipment off the drawing board. Apart from my Rotel, pre pro, my Direct TV HD DVR and one Sony Bravia TV, I don’t think any of the rest of my extensive equipment list is talked about on the forums. It was a chance to hear what is “on offer” so to speak, and make some acquaintances. Also I attended as many of the didactic sessions as I could, but I gave up the lions share of the last day, to try and carefully evaluate the sound in the demo rooms. By that time others had already had their chance to to hear the movies, booms crashes and explosions. I wanted to hear the quality of the sound on offer. In all of the rooms, I used mainly for evaluation a disc of keyboards suites by Jean-Philippe Rameau. (Hyperion CDA 67597) This disc is in a large series of superbly engineered discs by Hyperion devoted to the outstanding Canadian pianist Angela Hewitt. For this disc she chose an Italian Fazioli piano. These pianos are beautifully voiced and balanced, with a very clean delicate articulation. Recordings like this absolutely lay a speaker naked. In a couple of rooms I played the opening of Sir Edward Elgar’s oratorio The Apostles. The London Philharmonic Orchestra, choir, Choir of Downe House School and six soloists are conducted by Sir Adrian Boult. This recording (EMI CDS 7 49742 2) is widely considered one of the finest recordings ever made. It comes from the pre digital era and was superbly recorded in the Kingsway Hall before modern acoustic engineers ruined it. Now this is a recording I’m loath to use for an audition, as only very exceptional reproducers can do any justice what so ever to it. So I think it generally unfair practice, unless I hear a reproducer that might stand a chance, to offer this recording up. Two were of that caliber, but unfortunately I only got a chance to play it on one. It was played on another at the request of the demonstrator. This recoding has a wondrous sense of space and at the same time inner detail. It is beautifully balanced. There is tremendous deep bass detail, which many otherwise fine reproducers just leave out. Unless you have heard these disc on a reproducer with a very extended and accurate last octave, it is impossible to know what other reproducers leave out. The Pioneer 3-EX: – This is a new speaker from Pioneer. This is in a line of speakers build round a mid/tweeter coaxial driver. This is a scaled back version of the $18,000/pair 1-Ex. These speakers use coaxial mid/tweeter units. The woofers have woven carbon fiber cones. These speakers are therefore three way designs, with crossover frequencies sensibly chosen at 400 Hz and 2KHz. They claim to be time aligned. Nominal impedance is stated to be 6 Ohms, however with two woofers in parallel below 400 Hz, they have to be regarded a essentially four ohm speakers. I can not ascertain that these speakers are actually yet for sale, or confirm a price. But $6000 per pair was quoted. Unfortunately I only got to play the Rameau disc on these speakers, but it was an extended listen. The sub was kept operative. I have to say I was extremely impressed by these speakers. They were very well voiced and balanced. The image was rock solid and the piano placed in an entirely believable acoustic environment. The detail and articulation of the Fazioli piano was captured nigh on perfectly The only minor blemish, I was aware of a very slight bloating of the lower strings, by I think the port. However I’m used to the non resonant output from TL ports. I did notice in their movie presentation that the speech clarity was by far and away the best of the show. Speech was still highly intelligible, even in very noisy parts of movies. I think this is largely due to the coaxial driver. It goes along with Chris Seymour’s presentation of his measurements on center channel speakers. Chris Walker of Pioneer gave a figure of $6000/pair. If that is so, I rate them very good value for money. I did not get a chance to play the Elgar, but I would like to have. I would just love to get my hands on at least a couple of those coaxial drivers. I noted the mid range cone was very shallow, and made just about a perfect waveguide for the tweeter. I’m not usually impressed with far Eastern Speakers, but these really caught my attention. I though they produced the best sound of the show. The quality of construction and finish were superb. I understand the designer was formerly associated with KEF. Of interest is the fact that the speakers were powered by their SC-07 receiver. This is their mid range receiver using class D amps employing B & O ICE amp technology. I asked about their suitability for powering four ohm loads, especially given the fact that although the speakers were nominally 6 ohm, given the fact there are two drivers in parallel below 400Hz, they had to be four ohm below 400 Hz, except for the dual bass reflex impedance peaks. They stated that for most speakers of four ohms they will be fine but refuse to put it in print. I asked what they would do for warranty in the event a customer had a problem. They said they had extensive data on the loads offered by a lot of loudspeakers. I have to say I’m suspicious of this assertion. However they stated that if a speaker had an impedance curve they deemed unsuitable it could void the warranty. I could get no commitment that any list of unsuitable speakers would be forthcoming. They did however state that their flagship receiver the SC-09TX was unconditionally stable into all loads. The Snell D7 : - This is a two and a half way tower with a switchable rear firing driver. It is designed round modest SEAS Prestige 6.5cm paper coned woofers and a SEAS prestige tweeter. I have modeled these units previously, and would seem to be able to provide a level of performance beyond what their price point would suggest. I was told that these speakers retail for $4000 each, however I see they can be obtained for just under $2,200 on the Internet. The speakers were auditioned with the sub. I first auditioned these speakers with the Rameau disc. They gave a very creditable performance. Articulation and sense of space ere above average. The lower mid and upper bass were a little more colored tan the Pioneers. However the tonal balance was pretty accurate, with superior articulation. I tried the Elgar disc on these speakers. Perspective, balance and voices were reproduced well. There as fairly good bloom on the brass. The violins, had a reproduced quality though. This recording has very natural violin sound, on these speakers the violins were a little wiry, and lacked softness. The deep bass was the biggest difference between these speakers and my rig. The deep effortless natural foundation was lacking. The sound of the softly played tymps lacked depth of tone. The deep organ pedals made only a fraction of the effect they should have. However having said all that, the performance as very listenable, and had a good sense of space and perspective. For speakers in this price range they acquitted themselves well in what is a huge mountain to climb for any reproducer. I could not help but notice how affected the staff were by Elgar’s music. It seemed to affect them deeply. Elgar was a master at conveying feeling and emotion. So often on hearing his music, you say to yourself, “yes I’ve felt like that.” Elgar is known only to most Americans for the march from his Pomp and Circumstance March No. 1 played at graduations. That is a pity. The HSU HB-1H: – These speakers at $179 each are absolute gems, and outstanding value for money. They were being used, five of them with an HSU sub, to demonstrate the Sherwood R-972 receiver. This receiver contains the French Trinnov optimizer. This obviously is in competition with the Audyssey system. This system uses a cluster of microphones for set up. I have to say this system was able to achieve some excellent perspectives. Also you can set it to EQ below 300 Hz only, which I think is a big advantage. I noted on both systems the effects of EQ above the bass area were not entirely satisfactory. The system was ably demonstrated by Jeffrey Hipps, senior vice president. This system with its five identical speakers, was able to locate Angela Hewitt at her Fazioli piano just about anywhere in the room. She was moved over to the right corner with a commendably realistic soundstage. The sound of the piano was articulate and detailed and the bass better integrated with the sub than any other system. The lower octaves of the piano were reproduced very effectively. These speakers use a horn loaded tweeter to help achieve a superior sensitivity 92 db/1meter/2.83 volts. Horn aberration was remarkably slight, with a trace of brittleness to the piano sound. The speakers had a good tenor range, indicating good step response compensation, even though there is only one woofer. The impedance does drop to four ohms though, to achieve this, again indicatiog there is no free lunch. At Jeffrey’s insistence we played the Elgar disc. The system was able to achieve excellent perspective. The horn artifact marred the choral sound giving the chorus an “awe” character to their sound. This wars especially notable in the choral peaks. Bass was well integrated, but despite the excellent HSU subs, could not achieve the depth and authority of my system. For speakers, in this size and price range I thought they were outstanding performers, and remarkable value for money. Unfortunately horns are renowned for exciting higher order modes, and diffraction problems in the waveguide which become more pronounced at higher volume. The SVS MTS-01 and Audyssey: – In this room Kris Kyriakakis from USC and Audyssey was using this SVS set up to demonstrate Audyssey. I was able to spend some extended time with Kris. I was convinced that the system could improve the lower octaves, however I as not impressed with what happened above that, and Kris had to do some manual over rides to reproduce the piano to my satisfaction. The sound of the SVS system was very pleasant. I thought the bottom end still a little embellished, despite Audyssey. Perspective and detail were not quite of the standard of the previous system mentioned. However I have to stress listening to the performance as very pleasant with nothing overtly standing out to overtly irritate. At under $1000 dollars each I consider they represent good value for money. Emotiva: – Dan Laufman and general manager Lonnie Vaughn put on a good show in the Emotiva room. I got to spend significant time with Lonnie. I appreciate his generosity with his time. There was a a mouth watering amount of electronics on display. The hood was open so one could see the standard of construction. Emotiva’s boards, still are stuffed with through wire components, rather than robotically placed surface mount types. Boards were not overly crammed, and components were identified on the boards. I would think any competent service tech would have an easier time than usual for boards of modern manufacture isolating and repairing a fault. There has been talk on these forums of reliability issues with Emotiva electronics of late, so I asked Lonnie about it directly. He told me their failure rate as in the neighborhood of 1%. That is very good for solid state electronics. I have no reason to disbelieve his statement. He was not someone who I would have thought would have glossed over a problem. The trouble is the 1% of customers with a problem are inclined to vent on the forum. Like the vast majority of manufacturers they do not make their semiconductors and other components. Small levels of contaminants in the manufacture of semiconductors, have always been a problem. This I doubt will ever be entirely solved. Problems caused by these impurities will show up usually in the first few months of use. Now to the speakers. The movie demo was impressive, however I find it impossible to evaluate and know the worth of speakers on a diet of movies. So Lonnie put the Rameau disc on the ERT-8.3 towers at the back, driven form their CD player. First auditioning was extremely disconcerting, with no coherent image what ever. So much so, that I had to ask Lonnie to check the phasing of the speakers. Sure enough they were out of phase! I don’t want to make an issue of this, we have ALL done it. After correcting the phase, things considerably improved. However I have to report that I found this speaker had shortcomings. The image of the piano was still not well defined. The speaker was not bright and had good tonal balance. However, it had a slightly muddled quality to it. 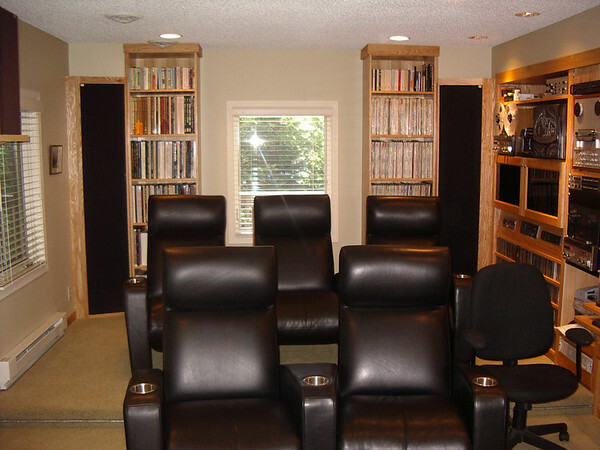 These speakers did not create for me a believable acoustic space. There was significant coloration in the lower middle and upper bass. At the asking price under $800 a piece, they can not be called a disaster or even poor value for money. However Lonnie’s laudable aim is to make a speaker excellent value for money, and not a speaker just good for the money. I discussed my feelings at length about these speakers. I suspect the problems are caused, by the fact that there are two mid range drivers, the fact that the low pass/bandpass crossover is 300 Hz, into the problem range for passive crossovers and some degree of cabinet resonance. I felt that the lower crossover was particularly problematic. The reason for using two mids, was to get sufficient spl to meet THX specs for spl. Unfortunately three ways are hard to execute, especially on a tight budget. In that price range, I would think they would be better off with a well executed two and and half way. Another attendee later told me their bookshelf speaker was a real winner, and so I later returned and asked Lonnie to please wire them up, which he kindly did. Unfortunately it immediately became apparent that the right speaker had gap rub. Dan immediately got the blame for overpowering them. I suspect the woofer had a dropped a voice coil turn. However on trying to listen through the buzz I think they may well have a winner here. On another note, the Emotiva CD player produced faint clicks on the Rameau disc, not evident on other players and my two players. I’m just mentioning this, and don’t want to make a mountain out of it. It is a fact of life that some discs will have problems on some players and not others. That is why I always keep at least two players hooked up. Simon Perry the late founder of Hyperion used to say, that the ability of a player to play a wide range of discs, was in inverse proportion to the cost of the player! I have to say I had an interesting time in the Emotiva room. EMP : – EMP is a division of rbh. They had some very attractive speakers on show. Hooked up were their prototype EF 70Ts EF70Cs and EF70, mains, center, surround/presence respectively. The EF 70T towers have a tweeter and six nice looking 5.25 inch aluminum coned drivers. Because of my long experience with the Jordan Watts driver, I’m very interested and partial to small aluminum coned drivers. So I wanted to like these speakers. I regret to have report though that in my view they are a disaster and not at all ready for prime time. Angela Hewitt’s Fazoili piano was unrecognizable. There was no sparkle, there was a gross excess of lower mid range and upper bass, giving this delicate instrument a bloated presentation. The whole presentation of the piano had a flat dull presentation. I noted that the movie presentations were at much too high a level, often a tip off there is something to hide. Movie voices had an unnatural quality and clarity left a lot to be desired. In short I could not live with these speakers at all. If I ordered them, they would ship out on the next UPS truck. I think speakers are making great strides, and I was impressed as much by the similarity of the speakers as differences. However EMP was”odd man out” by a mile. The designer Shane Rich, who also was generous of his time, was obviously disappointed by my assessment. I did suggest that he effectively has a line source with his six drivers with the problems that entails. I shared with him that I encountered similar problem using the JW drivers as a line source down into the bass. I suggested that, the upper frequency limit of each driver be reduced as you move down the line. This might well clean things up. I enjoyed Chris Seymour’s exhibit, and enjoyed talking to him. His 1000 watt class D mono blocks using class D ICE amps built by B & O have a superb build quality and a very classy finish. They ooze quality. As stated above, Chris gave a well researched presentation on the shortcoming of horizontal MTM center channel speakers. Those of you who know my posts, will know that I have posted about this on quite a few occasions. As far as other lectures, of those I heard, I would commend Jeff Pravia of Epson on projectors. I particularly enjoyed Jonathan Novick’s presentation from Audio Precision on Amplifier measurements. His data was obtained with resistive loads. I of course made a plea for tests with loads having up to 30 degree phase angles. The THX, and Audyssey presentations were also notable. This SOTU event, I thought was somewhat subdued as a result of the prevailing eccenomic conditions. It would have been nice to have had more presenters. Gene thought that the economy will have to show good signs of recovery before hosting another event of this nature. I find that regreteble but sensible and understandable. It was good to meet Gene and his lovely family. At the Banquet I sat with Rickster 71, Wayde Robson, and their wives. I dressed daft enough to get the best male costume award. 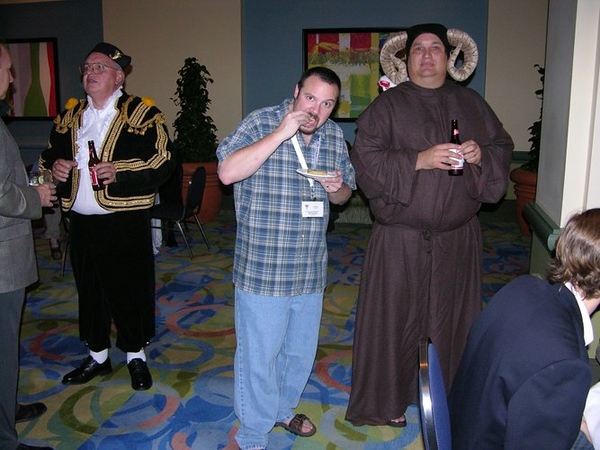 Majorlooser is sporting the horns, I’m the Matador! It was a great evening.